30 June 2018 saw the end of the 4th year at secondary schools for Chelsie Greasely at the St Joseph Convent, St George’s and Kazim Dottin at the St Rose Modern Secondary School at Gouyave, St John. Both students were promoted to Form 5 – their final year of secondary education; at the end of which they would be sitting their CXC exams in May/June 2019. In the case of Greasely, her academic results were satisfactory, but special congratulations must be accorded to Dottin for his consistent high performance in general over the past 4 years. 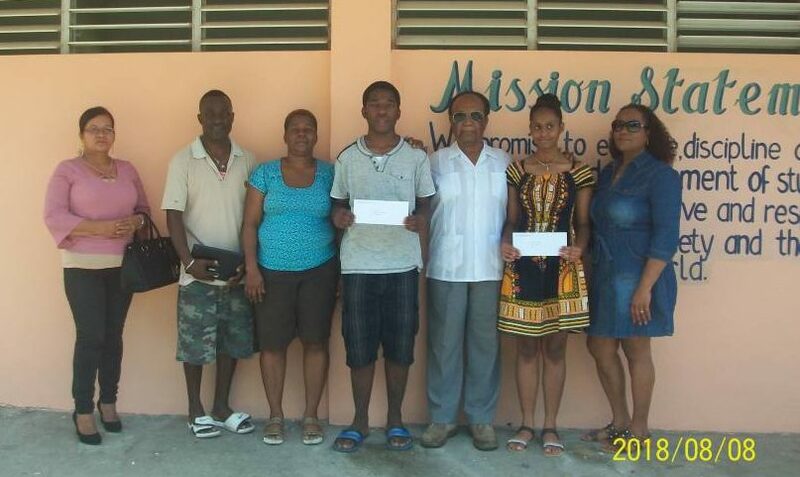 The students were both congratulated by their former principal and Mitchell and received their cheques for the new school year beginning 3 September 2018, in the sum of EC$1,500 each, per annum. Students, parents and principal expressed their gratitude to Mitchell for returning to assist his Alma Mater and for his contribution to nation building. Norris Mitchell is the retired principal of Norris Mitchell Associates, Chartered Architect and Urban Planner. Mitchell is also the founder and former President of The Willie Redhead Foundation, a non-governmental heritage conservation organisation.